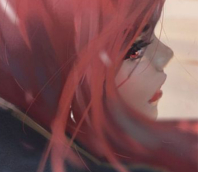 Scarlet red hair falls around the soft features of a round face. Drops of amber look out containing curiosity, greed and mischievousness. Enna has a lithe, agile form and moves with practised ease and confidence. She normally bears a smile, though it is quite often arrogant or mocking. Typically clad in black leather armour, boots and gloves. She is usually seen wearing a long but lightweight hooded coat with a gold trim. Enna favours combat with a light short sword and a selection of daggers. Enna is independent and resourceful, driven by greed and the need of a challenge. Enna enjoys manipulating of others to get what she wants, usually using flattery though harsher tones have and will be used if the need arises. Daughter to an absent at best Father and a meek Mother, Enna quickly learnt the art of wearing a mask to get ahead in life. She has a quick hand, silver tongue and sharp wits that usually allows her to stay one step ahead. Enna lost herself a long time ago, first to the need to escape her beginnings then to the greed that soon took the place of the need. She carries an arrogance with her that typically defines her personality as herself. However, she will rarely turn down an opportunity if money is involved. It is this greed that has led to some of the more difficult situations in her life as she seeks to rise above her lowly start. She shuns anything that relates to her old life and will rarely speak about her origins. A thief, first and foremost, she has been hired to retrieve many items from many places. Enna has been wearing masks for so long now that she tends not to be herself, in favour of being someone else. She will frequently play another character to get what she wants. She could be anyone. The elderly beggar who nobody notices. The charming dancing who wins hearts with but a glance. The sweet servant girl whose innocence goes unchallenged. The clumsy heiress to a trader’s estate who bumbles her way through life. Maybe even that plain girl next door who you never had the courage to ask for a dance. This is to name but her most common disguises and the ones she has practiced since she was just a girl. Born to Randal and Cefrey Malark in Syliras, Enna was destined to have an unremarkable life. Her Mother, Cefrey, was a seamstress and her father was a dock worker. She never really knew her father however. Even now, all she has is one memory of him carrying her and laughing. Randal left when she was four aboard a ship and never returned. Although he had done it because the pay was as high as the risk, her Mother had let Enna think all these years that he had left them as he hated Enna. Enna has never had a cause to think differently and so has never searched for him. Unable to deal with the loss, Cefrey went into mourning and depression. But it is not all doom and gloom. As Cefrey withdrew into herself, Enna began to be given freedoms that she didn’t have before. Even as a young girl, Enna seemed to understand that her lot life was more than being a simple seamstress like Cefrey. She found that as a child, she could get into places that others couldn’t. Whether that was because of her small size or the fact that most paid no mind to a child running around. It was through this art that she learnt to read and write. One path led her to a classroom where she could stay out of sight. Watching from the shadows, it took longer to pick up than it probably should but it helped when her Mother was too drunk to teach her. Cefrey quickly took to alcohol to try and drown her sorrows. Her work suffered, if she even managed to come out of her stupor long enough to go. By this point, several years had passed. Enna had grown into an attempt sneak and pickpocket. She got by on the scraps she managed to steal and the small coins she palmed. She began to use her age to her advantage. The Knights for their flaws, were more lenient with her if she played up the young, poor, unfortunate soul with a drunkard mother and a missing father. During her eleventh summer, Cefrey was let go from her position and sank further into the depths of depression. Unable to pay to keep their home, Cefrey was evicted. On the street with no money but what she could beg, Enna could only watch her mother waste away further. Enna had become jaded to her mother’s suffering. She saw it as self-inflicted harm. Whereas she still got by from what she could steal, Cefrey could not. It was around this time that a band of travellers came into the city. They had all their belongings with them and it proved too much of a temptation for Enna. During the night, while they performed, she stuck to their carts and began to search for what she could steal, barter with and make more money. But it seemed her look had run out. A hand grabbed hers as she was focused on sifting through some valuables. The man was in his mid-twenties, he was a muscular but lean figure, clad in black. He had daggers at his belt and a hood shadowed his face. She twisted away and attempted to run but as a child, she was never going to get away. Surprised by her fledgling skills, rather than report her, he introduced himself as Riardon. He offered to teach her properly in her ‘art’ as he called it. Unable to turn him down for fear of a jail cell, she agreed. As the travellers moved on in a day or so, Enna went with them. She left her Mother a note while she was unconscious on the floor. She knew her leaving would be the last stake in her heart but there was nothing for her here. So, she travelled, to Sunberth, to start a new life. The lawless town was perfect for her. Riardon made good on his word. He showed her how to sneak, unheard and unseen, made her practice day in and day out. He would give her tasks for her to complete and would observe from a distance. He watched as a proud father would. As the girl he caught in Sunberth grew every day. Enna’s confidence bloomed and so did her skills. Riardon soon realised that she was competent at more than just stealing. She had a knack for disguising herself, talking her way through doors that would have remained locked. But the same skills that allowed her to slip his grasp once, were as sharp as ever. At the age of sixteen, she was truly beginning to find her own way. Confident in her skills, he brought her along on one of his contracts. It was a simple smash and grab. Enter the storehouse, find the item, leave and deliver it to his contact. But it went south. Someone had tipped the gang off. They were ready for him. Enna had been left to secure the exit but could only watch as Riardon tried to fight his way towards her. He shouted to her to flee and she did. Several members of the group saw her escape, most notably her scarlet locks. That was three years ago. Since then, she has been quietly looking for who set them up and honing her skills further to allow her to find the answers she seeks. Riardon was her teacher, he deserved a better end than what he got.